The first American Dracula serialisation. Dracula scholar, Hans Corneel de Roos, has uncovered what may be the first American Dracula serialisation. The first installment was published in the Sunday Inter Ocean (Chicago), May 7, 1899. Picture supplied by Hans Corneel de Roos. Hans Corneel de Roos has proved to be a dab hand at Dracula scholarship; readers may recall his World Dracula Day Vamped article last year, sharing his findings about claims made by Raymond T. McNally (1931–2002) and Radu Florescu (1925–2014) regarding Vlad Dracula’s taste for blood. The article proved to be controversial for some of McNally and Florescu’s fans relating to its hard-to-escape conclusion: the two scholars misrepresented text in a poem by Michael Beheim to “prove” the historical Dracula was a vampire. In the meantime, De Roos not only organised the Transylvanian Society of Dracula’s Fourth World Dracula Congress, but also spearheaded significant research into the Icelandic translation of Dracula, renamed Makt myrkranna (Powers of Darkness) when it made its debut as a serial in Fjallkonan‘s January 13, 1900 issue. 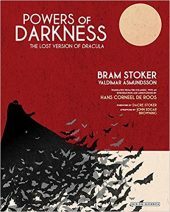 De Roos’ English translation, Powers of Darkness: The Lost Version of Dracula, was released earlier this year. The translation was most famous for including a preface (not in the original English version), apparently written by Stoker, which in typical Gothic style, alleged subsequent events in the novel were based on a true story. 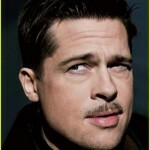 However, De Roos discovered that the Icelandic translation of the novel was more than it seemed; “adaptation” would be a more accurate word considering how much it deviated from Stoker’s text. But the plot thickened further still after a tip-off: it turned out that the Icelandic version is actually based on a Swedish adaptation called Mörkrets makter. De Roos is conducting further research into the Swedish text, which he was able to source from the Royal Library in Stockholm. As if that wasn’t enough, De Roos’ tireless research has turned up yet another find: the earliest American newspaper serialisation of Dracula. Following the work of Stoker biographer, David J. Skal, the earliest was assumed to be “Dracula: A Strong Story of the Vampire,” published in the Charlotte Daily Observer between July 16–December 10, 1899. It’s not. 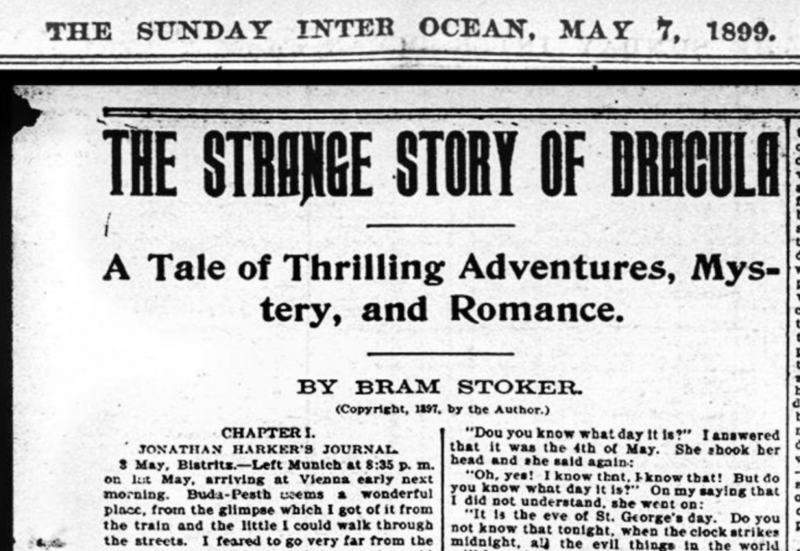 De Roos unearthed “The Strange Story of Dracula: A Tale of Thrilling Adventures, Mystery, and Romance,” a Dracula serialisation spanning Chicago’s Inter Ocean‘s May 7–June 4, 1899 issues. Furthermore, there may even be a bridge between it and the Swedish version, which De Roos discusses in his exclusive report for Vamped which you can download, below. Hans Corneel de Roos: “Next Stop: Chicago! Earliest U.S. Serialisation of Dracula Known So Far Discovered. Was It the Source of Mörkrets makter?” (7.80 MB pdf). readers may recall his World Dracula Day Vamped article last year: Hans Corneel de Roos, “Bloody Nonsense: How Two Scholars Pulled Off the Great Dracula Swindle,” Vamped, May 26, 2016, accessed May 25, 2017, http://vamped.org/2016/05/26/great-dracula-swindle/. the Icelandic version is actually based on a Swedish adaptation: Anna Margrét Björnsson, “Icelandic Version of Dracula, Makt myrkranna, Turns Out to Be Swedish in Origin,” Iceland Monitor, March 6, 2017, modified March 7, 2017 13.34, accessed May 25, 2017, http://icelandmonitor.mbl.is/news/culture_and_living/2017/03/06/icelandic_version_of_dracula_makt_myrkranna_turns_o/. archive.is link: http://archive.is/M51ja. May 26, 2017: Slightly modified version of De Roos’ report uploaded under “Report,” expanding on fnn 49 and 60. May 27, 2017: The May 26, 2017 update read “Slightly modified version of De Roos’ report uploaded under ‘Report,’ expanding on fnn 49 and 60.” It is actually fnn 49 and 69. Next article World Dracula Day: Happy 120th Birthday, Count!